The illustrated Eye Brand Knife is the Eye Brand Stockman Knife that features clip, spey, and sheepfoot blades made of hammer forged Solingen carbon steel. Hammer forging compresses and realigns the grain structure of the blade steel, thereby increasing the toughness and edge holding characteristics of the knife blade. It is a more costly and time consuming process, but worth the effort. 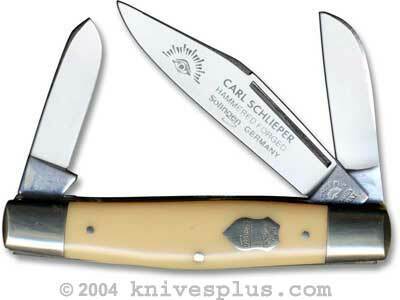 The yellow composition handle of this Eye Brand knife, 3 1/2" closed, has brass liners, nickel silver shield and nickel silver bolsters.